TO BRIBE Madame LeBièvre and Clint Flicker , CLICK HERE! Say hello to Madame LeBièvre, Durham's town gossip! Careful not to share anything private with her---Madame is famously loose lipped! While she is likely to share your private affairs, very little is known about Madame LeBièvre herself. Many call her a judgemental snitch, so we asked her why she can seem so stand-offish. LeBièvre told us that she likes to be thought of as a mysterious hooded lady. She gets her fashion and lifestyle inspiration from the Russian spy Ivana Lovemiself. Madame LeBièvre told us she is incredibly superstitious and visits her local psychic Cleo Taurus several times a week. Madame even revealed that in addition to her lucky rabbit’s foot she also carries a lucky camel’s toe. Her interests include lip injections, hanging curtains, and roast beef, but cold hard cash gets her excited too. Bribe her and she'll tell you everyone's secrets. Please welcome Clint Flicker, Madame LeBièvre’s “assistant”. Clint Flicker is a modest beaver who is loved by many for his sensitivity and acts of touching generosity. Clint is a handy man and a lifelong fisher. He knows his way around lures and tackle and he is considered by local experts to be a master at baiting-- just watch as his wiggly worms are gobbled up instantly by thirsty fishes! 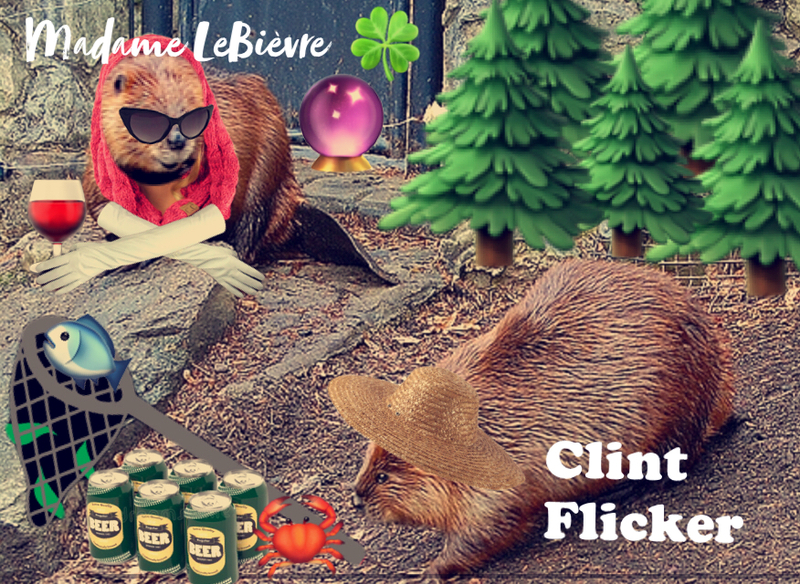 A dear friend of Madame LeBièvre, Clint Flicker told us that while she is bristly on the outside, she has a soft tender heart, just like all beavers. We were not convinced.